The implicit assumption I’m making is that you understand the benefits of focusing on macro targets, have calculated your macros, learned how to count and make meals out of them, but keep struggling to find a balance at the end of some days. If this is you, rest assured that this is something that everyone experiences at some point. In this quick guide, I’ll teach you how to fill in the gaps quickly, easily, and with foods you enjoy. “Balancing foods” is a phrase I made up to describe food choices made with the primary focus being to help us hit our macro targets by the end of the day should our meals fall short. Taste, while important, is a secondary consideration to convenience for most people. As I said in my guide to making meals out of macros, the majority of people will find success easiest when they build 10-12 meals that they enjoy and fit their macros, then just eat the same meals over and over again. Yes, variety is marginally constrained, but the alternative – feeling like you’re on a macro hunt all day every day – is exhausting and unsustainable. You’ve crafted the near perfect meal set for a day, but find yourself either over or under a specific macro target. – This is an ongoing issue which needs to be fixed ASAP. You weren’t able to eat your regular meals and had to improvise, which left you short of certain macro targets at the end of a day. You get home late, tired, would prefer the extra sleep time than to cook, and want some quick and easy options. It is variations of these two scenarios we will focus on in the examples below. First, have a look at this food Venn diagram food cheat sheet. Focus on the foods comprised of predominantly one or two macronutrients on the outside, those in blue and yellow. Take note in particular to those foods that you enjoy. We’re going to use this to help us fix issues you might find yourself having with examples below. It is not close to an exhaustive list, so feel free to add your own. 1. How to balance out your meal plans to get your macros right. Here are some of the common issues. 👉🏻 I can’t eat enough high protein foods to hit X g of protein in a day. This is a problem typically raised by people who have recently decided they are going to start counting macros but are unwilling to change their #eatoutalldayeveryday #restaurantlife lifestyle. Yes, you will find it very hard unless you are prepared to cook. Assuming you are cooking, then it’s just a case of increasing the amount of meat that you eat. For example, I have a protein target of 220 g per day. Two large chicken breasts (one for lunch, one for dinner) will weigh around 600 g (~21 oz) in total and have 150 g of protein. Two 25 g scoops of whey in the morning before my training brings this to 200 g, and the incidental protein from other foods takes me to my target. Boom. 👉🏻 I’m over my fat target considerably. This is usually a problem that occurs when people increase their meat intake. Choose leaner cuts of meat or a ‘leaner’ cooking method. Swap out the chicken thigh for breast, pork belly for lean pork loin, the 80% lean mince beef for 90%. Use less oil in the pan, or try grilling or baking instead of pan frying. If you consume salads be aware that oil-based salad dressings can quickly add up. Consider swapping these. 👉🏻 I’m under my fat numbers and don’t know what to add or adjust. Swap out some of your meat intake for eggs or cheese. Add an oil based salad dressing. Note: A high dietary saturated fat intake can increase heart disease risk factors. The topic is complicated1, but as a rule of thumb, try to keep your saturated fat intake equal to or lower than your unsaturated fat intake, especially when in a caloric surplus. Consider this balance before adding a stick of butter or spoon of coconut oil (which is 90% saturated fat) to your food. I say this because with the recent come back of keto diet dogma and wider diet hipsterism, people seem to have been tricked into thinking that coconut oil and butter are magic. – They are not. Potentially avoiding a heart attack is more important. For the same reason, try to avoid trans fats. 👉🏻 I’m too full and struggle to eat enough carbs by the end of the day. Space your meals out. – Don’t rigidly stick to an 8-hour eating window. Consider having breakfast. Consider eating some cereal with skimmed milk. Consider drinking some of your calories. – Swap some of your meat intake for a protein shake, some of your starchy carb intake (potatoes, rice, pasta) for fruit juice. 👉🏻 I struggle to keep my carb intake low enough. Swap any refined, sugary foods for starchy foods (rice, pasta, bread, potatoes) as these will keep you fuller, for longer. Potatoes seem to be the best for this. If you’re cycling your macros to have more carbs on the training days than the rest days, consider stopping this. – Sustainability is more important. By irregular days I am referring to those days where you are not able to stick to your usual meal plan. I’m going to give examples here based on my food preferences. Obviously, tastes differ and you need to go with yours, so please don’t blindly copy mine thinking they are special. Bear in mind that maintaining the calorie balance for the day is more important than hitting any particular macronutrient target, so, don’t hit a macro target at the cost of going over calorie balance for the day. So, let’s say for example that you are looking for 150 g of carbs at the end of the day and no other macronutrients. Practically, this would be nearly impossible to do in a palatable way. So, consider this to be a 600 kcal target, and choose foods from the carbs side of the diagram. 👉🏻 You are 150 g of carbs short of your goal. Oats and a large banana. 👉🏻 You are 40 g short of your protein target and 50 g short of your carb target for the day. Yogurt with a scoop of whey protein mixed in and a banana. 👉🏻 You’re short of your fat goal by 20 g; your other macros are fine. You need 180 kcal predominantly from fat. Assuming you have already eaten and you can’t add a little oil to one of your meals, this means you’re left with a lot of unappetizing decisions link gulping down a big spoon of oil. Eating 30 g (1 oz) of nuts, though of a mixed macro profile, is probably your best choice. 👉🏻 You’ve exceeded all your macros. This means you are over your calorie target. If you know how much, 500 kcal, for example, you can reduce this from your food intake the next day, or spread that out over several days (166 kcal over three days), to balance things out for the week. If you don’t know how much you were over, just go to bed and don’t worry about it. 👉🏻 You’ve eaten out and estimate you are 50 g short on your protein targets. Consider having a protein shake or ‘protein mug cake’ (instructions below). However, do not do this if you estimate you were over on your other macros and thus over on your total caloric budget. Recall from The Muscle and Strength Nutritional Pyramid of Importance, hitting your caloric intake is more important than hitting your protein intake (or any other macronutrient for that matter). 👉🏻 You ate out and could not fully control what was on that particular meal. If you can, try to estimate what is in the meal by eyeballing it (refer to the sister article on counting macros for more on this). ‘Adjust’ things after as best you can with one of the examples above. 👉🏻 You’re going away for the weekend and won’t be able to cook. If you have been dieting for a while, you risk binge eating if left to your own devices. Eyeball your foods if you can, but if you can’t (or don’t want to), just apply the following rules that my clients have had success with. It takes a while for your brain to signal that you are full. So, make a conscious effort to chew your food slowly. Ideally, eat some salad first, followed by protein, and then the rest after. Take some protein powder with you in case the protein portion in restaurants isn’t large enough. Don’t be afraid to leave things on your plate. I add this here because advice for hitting protein targets is such a common question in comments on social media. Drink it as a shake. – Use some ice and/or fruits to make it filling and more smoothie-like. Stir it in your yogurt. – Consider adding some fruit for flavor, volume, and micronutrition. Chocolate whey and banana in a plain vanilla yogurt works well. Make yourself a protein mug cake. – Grab a mug, add a scoop of whey, add a little cold water until you make a sludgy consistency and then nuke it in the microwave for 30–45 seconds. Don’t overcook it or it will end up dry. Protein Pancakes. – Similar to our mug cake method but cooked in a skillet. You could add in some banana, greek yogurt or any other topping you like to add more nutrition and flavor. Oatmeal fan? – You can create an easy, moderate-carb high-protein meal by adding a scoop or two of whey to it. Mix the protein powder with the cold milk or water first, before cooking on a low heat to avoid clumping. Protein coffee. – Make sure to mix the whey protein with cold milk or water first so you don’t get lumps. You can use instant or any espresso. Grab your mug, mix the whey into a little cold mix or water first to avoid getting lumps, then add the hot coffee. Approximately half of my clients travel regularly for business and have to implement these strategies often. This makes things more challenging, but by far, the most important determinant of success or failure for these clients over the years has been their attitude. – Aim to be consistent over the long-term rather than stressing yourself above being perfect. Do what you can rather than taking minor derailments as an excuse to binge-eat for a day. We are the product of our habits, not the occasions. Thank you for reading. If you have any questions please hit me up in the comments. If you can think of someone who might benefit from reading this, please share it. Like, seriously complicated. I’d highly recommend this article on Examine.com if the subject interests you. “We have evidence that eating more saturated fat (instead of unsaturated fat) increases known risk factors for heart disease, such as blood lipids, but studies looking at the big picture do not find a link between saturated fat and heart disease. How can this be? “The simple answer is that fat intake is but a single piece of the heart-disease puzzle. Eating more saturated fat may increase your risk of developing heart disease, but that doesn’t mean you will develop heart disease. Conversely, banning all saturated fat from your diet does not make your heart attack proof. I am relatively new to applying the concept of tracking my macros and have read that doing so in addition to high carb versus low carb days can help train my body to naturally burn unwanted restored fat but again, I am new to all of this and don’t know exactly what works right for me just yet. What is your opinion on the idea of adding in high and low carb days? Ex:) if I’m an endomorph I would consider five low carb days and two high carb days. Is it the opposite of what tracking macros on a regular basis is all about? Lastly, if you do recommend high and low carb days to help burn fat then do my work out routines matter as far as what days I would do my HIIT work outs and light weight training considering some days I might have less energy due to lack of carbohydrates. Hi Jesse, thanks for the questions. What is your opinion on the idea of adding in high and low carb days? – The benefit will be marginal, at the novice stage and probably no direct fat burning benefits, so if you find it hard to sustain, don’t. I use this with my clients mainly to increase food variety so that they don’t find things monotonous, the potential calorie partitioning effects are secondary (clients are not novice trainees nor new to cunting things). More details in the timing section of my Complete Nutrition Setup Guide. – No, you can still track your days independently. …considering some days I might have less energy due to lack of carbohydrates. – There’s less food going in your mouth, but your body can still fuel itself from fat stores and glycogen stores. Your training won’t be affected. 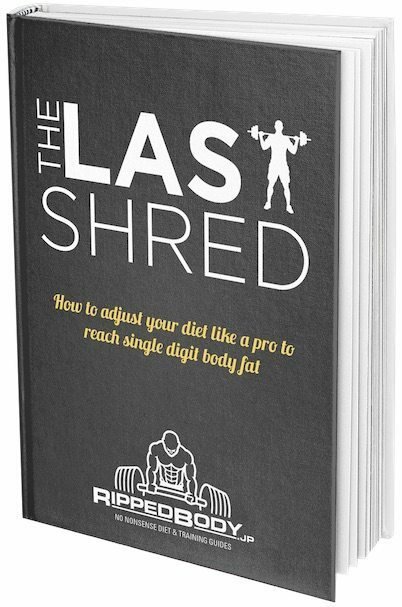 I don’t recommend HIIT for fat loss, dietary control should be the primary method of achieving the necessary caloric deficit. More on cardio here and here. Is it important to eat your carbs, protein and fats in any balanced manner each meal, or just so long as you meet your daily goals, meaning, maybe dinner is carb heavy but lunch was mostly just protein, etc? It’s important to spread your protein out mostly evenly, but for the carbs and fats there is flexibility and scope for personal preference. Just don’t skew to extremes. This will be taken care of in the “activity multiplier” you chose after calculating your base metabolic rate, to estimate daily energy expenditure. Once this is set, don’t fiddle with it on a day-to-day basis. It’s unsustainable to do so and the ways we have of tracking it are error prone. This might sound crazy, but the most success I’ve had, as far as adherence and results, was when I followed the Slow Carb diet (a la Tim Ferriss). It’s been a while, but I picked it back up again since the beginning of 2018 and have shed ~20 lbs (9kg) so far. I’m never hungry, and I also feel lighter, leaner, and less bloated eating fewer carbs (feeling like I look leaner might be a mental thing which probably helps with my adherence). In general I feel more in control, whereas I usually overeat carbs and undereat protein when counting macros. Lastly, I allow myself to eat whatever I want once a week (usually sushi, but sometimes a slice or two of pizza and some cookies) which has satisfied me enough to stick with my plan the rest of the week. What would a sensible macro split be (percentage-wise) if I wanted to follow a lowER carb diet but allow some carbs in my meal plan? If it’s something I need to test and adjust, what percentage split of P/C/F would be a good place to start? Is this even wise, or should I stick to Slow Carb protocol (which doesn’t count macros) since it’s been working? It’s working – you’re happy with the rate of progress – and you’re happy doing it, so my advice would be to stick with it. Only add in a layer of complication such as counting when it no longer does. Curious on your research and experience with protein absorption. Lots of misconception out there online, and differing research out there as well. For example, some mainstream health sites saying your body can only absorb 25-30g of protein per sitting (I.e. eating every 2-3) hours. For someone who does IF, this is a true struggle to reach those daily protein macro goals (~205g/day). Can you provide any insight into what seems like an easy myth to bust? There’s a long answer to this, but I’ll stick with the short one. If you stick with the meal frequencies recommended in the setup guide, this is not something to worry about. One note: there should be absolutely no problem with having a 50g shot of olive oil in case you need fats in your diet. I’m balancing with olive oil shots (from 10 to 50g, depending on the rest of the day) as it is the easiest way (both in exact dosing and having it done – 3 seconds max) to do that. Sure, not a technical one, it’s just the taste one I was referring to. Besides, the article does not exactly answer the question I asked in the e-mail: I was rather referring to a short-term change in meals TIMING, i.e. I eat normally 2:30 – 10.30 P.M. and I change to standard 3-meals routine (breakfast, lunch, dinner) for a few days – is that okay? Not sure what email you are referring to, but the answer is yes.